We’d love your help. Let us know what’s wrong with this preview of Leave Tomorrow by Dirk Weisiger. To ask other readers questions about Leave Tomorrow, please sign up. 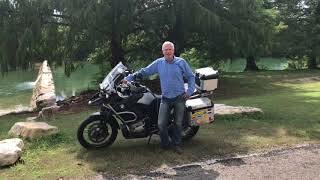 I'm a seasoned traveler, but after reading about Dirk Weisiger's journey to the Bottom of the World on a motorcycle, I am in complete awe of his courage, audacity, and adventurous spirit. Leave Tomorrow has a couple of vibes. First and foremost, this story is a chronicle of one man's journey from Texas to Argentina on a motorcycle, the Iron Horse (the relationship Dirk has with his motorcycle is fabulous). 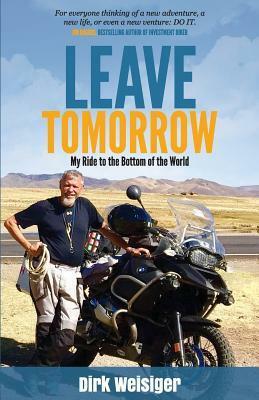 This adventure is filled with friendly people, tests of patience, danger, uncertainty, exci I'm a seasoned traveler, but after reading about Dirk Weisiger's journey to the Bottom of the World on a motorcycle, I am in complete awe of his courage, audacity, and adventurous spirit. Leave Tomorrow has a couple of vibes. First and foremost, this story is a chronicle of one man's journey from Texas to Argentina on a motorcycle, the Iron Horse (the relationship Dirk has with his motorcycle is fabulous). This adventure is filled with friendly people, tests of patience, danger, uncertainty, exciting escapades, and a willingness to meet new people, all with a ready smile and a curious nature. Second, Leave Tomorrow is an inspirational travel book that encourages people to visit lots of new places, with some being well-known tourist destinations and some way off the beaten path. Saying "Yes" to that unknown can be scary, and people may call you crazy, but according to Dirk, "We're never really ready for anything, and we won't know until we try. Try, and you'll figure it out." This is one of the many Life Lessons Dirk scatters throughout his book, sharing those words of wisdom he learned on his journey to the bottom of the world. (some learned the hard way). What I love most about Leave Tomorrow is the encouragement to live your own movie, create your own story, and Leave Tomorrow. It's never too late, and it doesn't necessarily have to mean traveling to a foreign country. Adventure comes in all shapes and sizes. What Dirk emphasizes in this book is the urgency to stop putting off that journey, whatever it may be. I agree completely because I have redefined my comfort zone many times over the past 15 years, and I don't intend to stop looking for that next adventure any time soon. It's way too much fun wondering what's around the next bend in the road. I'm not too proud to admit that I sort of begged to review this book. My husband owns the DVD boxset of The Long Round and The Long Way Down, and I was hooked right away. When I saw that Weisiger's book was of a similar nature, I had to get my hands on it. I was ecstatic to see that he covered a different part of the world and completed the journey ALL BY HIMSELF! No camera crews to back him up if something went wrong or a translator was needed. And as I set the book down and got my notebook rea I'm not too proud to admit that I sort of begged to review this book. My husband owns the DVD boxset of The Long Round and The Long Way Down, and I was hooked right away. When I saw that Weisiger's book was of a similar nature, I had to get my hands on it. I was ecstatic to see that he covered a different part of the world and completed the journey ALL BY HIMSELF! No camera crews to back him up if something went wrong or a translator was needed. And as I set the book down and got my notebook ready to take notes, my husband glanced at the cover and said, "Hey, I want to read that when you're done with it." I'm an avid reader and that is probably the second time he's ever said that to me during our nearly 10 years of marriage! What really stood out to me is the odd formatting of the book. Because the sections are quite short, I guessed that the blog posts he wrote during the journey were used for this book. Upon investigating his website, I noticed that there weren't many blog posts, and that these travels were not among them. So if my hunch is correct, he probably took the posts down. No shame in the game. Plus, a portion of the proceeds benefits the children at the Colegio Bautista El Calvario private school in Nicaragua. When I got to the part of Weisiger's journey where he wanted to do something for those kids, I honestly smiled knowing that this book will do even more great things for people that Weisiger has met along the way. The short sections work though because the story flows nicely. And even when he says something aside or pauses the story for a quick tip, it's relevant to what is happening and doesn't really take you out of the story. I really enjoy the variety of those tips because they are a tasting of what this book is: part memoir, part travel guide, part inspirational book. I don't know where you are in your life right now, but this book was exactly what I needed. Sometimes when life gets you down, belief in a higher power is the only thing that will lift you up. So I loved the imagery of his recollection of struggling to climb Mt. Kilimanjaro. How he wanted to give up on ever reaching the top, but knew that if he would just step right where his guide had step, then he would eventually get there. He uses that as a metaphor for his faith in God, but as he later says, "This book isn't a Sunday School lesson, but might be a Monday-school lesson in pursuing your dreams" (p. 9). I loved that! Weisiger doesn't talk much about his artistic side, but he has a great eye for composition. I wish that the photographs in the book were color, but I guess this will encourage people to visit his website. (Toggling back to his page now...) Where you can actually buy prints. Well, there you go. Looks like he knows his photos are pretty darn good! I hope to one day take Weisiger's advice and just plan that trip and go. Something that might be slightly uncomfortable but I feel I had to mention: Weisiger's compassion for the plight of illegal immigrants vs his intention to vote Trump (this was before the election, obviously). It really underlined for me how multifaceted politics and people's political leanings can be. And it made me even prouder to live in a country where we can vote more than one way. That our only choices aren't socialist or dictator, like many of the countries Weisiger visited. This book also pointed out to me that these "scary" countries are 95% people just trying to provide for their families and the other 5% is what makes national news. If it bleeds, it leads is the saying, right? Also, this isn't the first time that I've heard of people from other countries telling the U.S. traveler to spread the word that U.S. citizens are welcome in their countries. And lastly, a great nugget of wisdom: while learning the language isn't necessary, it is much appreciated. I initially thought this would be a story of a man and his motorcycle - like a boy and his toy. That only demonstrates the futility of misconceptions. The motorcycle was only a tool used to help a man fulfill a dream. I thought the level of detail in the writing was perfect to keep the story moving. I’ve read some books where the details bog down the story. Not this one! Once you begin to turn the pages and head south with the author - way south - there’s no stopping until you get to the end. I enjoy travelogues and I liked this book despite certain weaknesses. It is self-published book by a guy who is not a professional writer but who has traveled several continents, climbed many mountains and has an enthusiasm for the road. He loves the adventure of new people and places, and he contrived a way to convert a conventional lifestyle into an epic journey. His authenticity and freshness counterbalance deficiencies in elegance and depth. Average rating 4.3 for the Lone Star Book Blog Tours team. Dirk Weisiger is a travel trekker, trick roper and storyteller. As a teenager, and through years of building a successful business, Dirk has always enjoyed speaking to groups, spinning tales, ropes and offering lessons he has learned in adventures of life and business. He has travelled to five continents and climbed Mount Kilimanjaro and is a true adventurer. After reaching his goal as a successful Dirk Weisiger is a travel trekker, trick roper and storyteller. As a teenager, and through years of building a successful business, Dirk has always enjoyed speaking to groups, spinning tales, ropes and offering lessons he has learned in adventures of life and business. He has travelled to five continents and climbed Mount Kilimanjaro and is a true adventurer. After reaching his goal as a successful businessman, Dirk was ready for something new. But he was not sure what. Maybe a motorcycle adventure! What followed was a fourteen-month, solo motorcycle journey from Austin, Texas to Ushuaia, Argentina, filled with unexpected adventures, surprises and lessons about life and travel. Dirk headed south to “see new vistas on a solo journey but ended up feeling more connected to the people he met along the way.” His journey solidified his belief that making new friends is the best part of travel! One of Dirk’s objectives is finding a cause bigger than you and he had no idea that a cause would find him when he drove into Managua, Nicaragua. During his travels through Nicaragua, he stumbled upon Colegio Bautista El Calvario. He quickly became passionate about helping these children to receive a better education and to help support his cause, a portion of his book sales are given back to the school.